As they say, breakfast is the most important meal of the day. And waffles are delicious no matter what time you’re eating them. My great uncle gave my grandfather a waffle iron a while back. After my grandfather passed away last month, Boy and I brought home the waffle iron for safe keeping. So in honor of both of these wonderful men, we have a very different pie iron breakfast from the last. 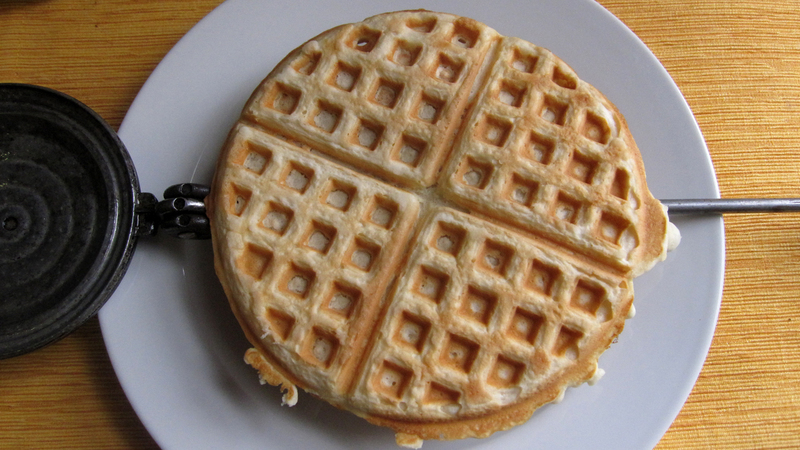 And now…on to the waffles. * To make the waffles, our favorite mix is Krusteaz Buttermilk Pancake Mix (they have specific instructions for using this mix to make waffles). For this one, you don’t have to use eggs and this mix won’t expand very much when you put the waffles into the pie iron. We had a rather unfortunate sandwich explosion a while back when we tried using Bisquick Original Pancake Mix. Mix the waffle mix together and cook them in a waffle maker according to the instructions. They should be golden brown when cooked. Place them on a plate to let them cool. They may steam a little bit and soften which is actually a good thing for the purposes of pudgy pie sandwich making. 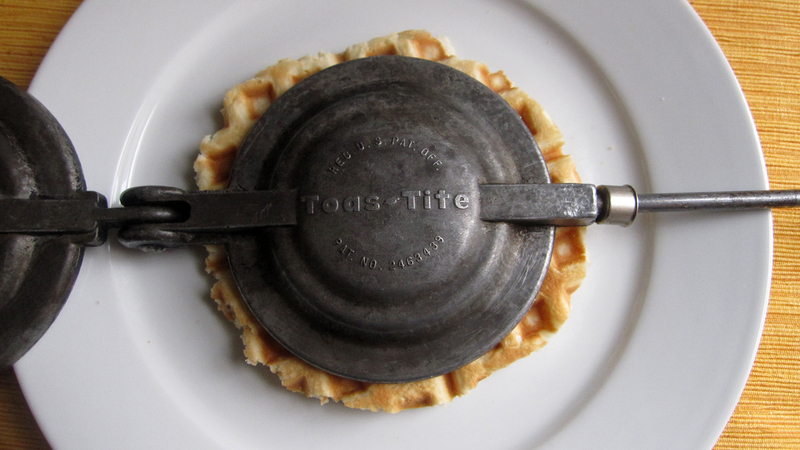 We like to size our waffles by placing the pie iron on top of the waffle. Then we trim about half an inch around the edge of the pie iron. Spray the pie iron with non-stick spray. Place one waffle into the iron. 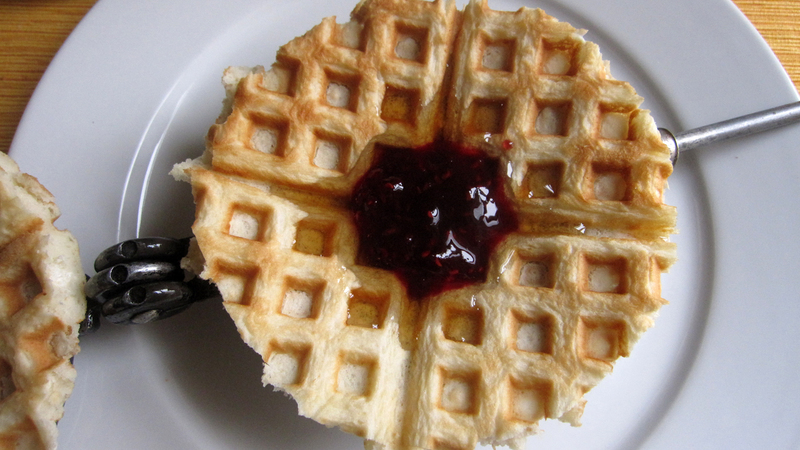 Add the jam and syrup into the center of the waffle (or filling of your choice*). 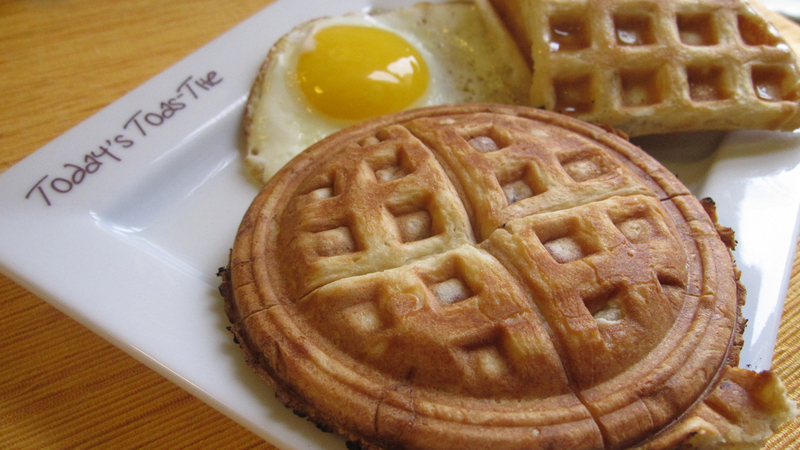 Using a pastry brush, brush egg white around the edge of the waffle. This will help ensure a strong seal. 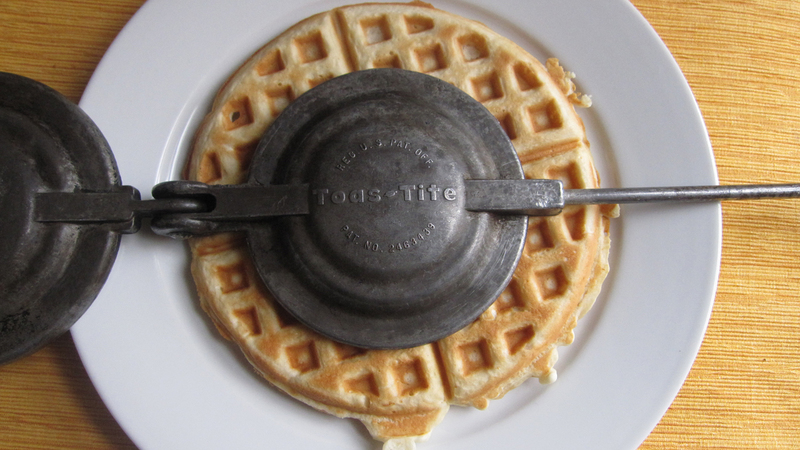 Close your pie iron, trim the excess waffle and toast over medium-low heat for 3 minutes on each side or until the waffles are toasted and slightly crispy. Fry up your egg and now you’ve got breakfast! 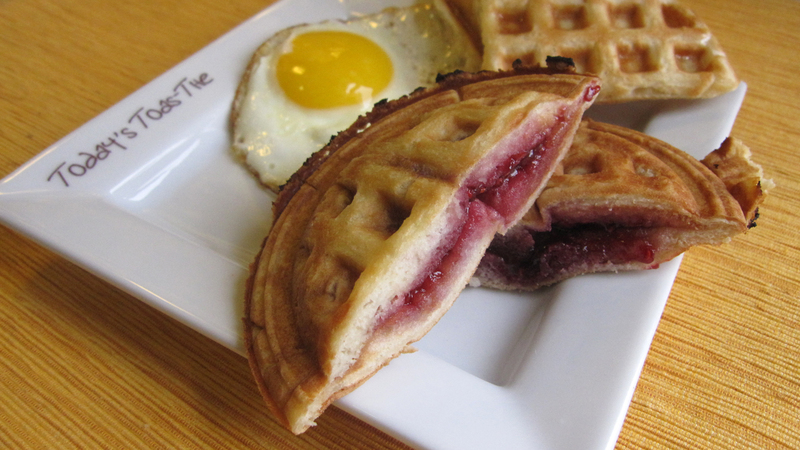 For our first waffle pudgy pie, we went straight jam and syrup. The syrup absorbs into the waffle so you don’t end up with a dripping mess but you still get that nice maple syrup flavor along with the jam. Of course, you can use any kind of jam you like! Besides that – you can use whatever filling you’d like. We’re thinking banana and syrup (almost like a stuffed french toast, really), blueberry and syrup, chocolate chips and maybe a little peanut butter…the possibilities are endless. Another one we want to try is chicken and waffles. So keep an eye out for lots of variations and we’re excited to hear what you come up with too! Oh Yum and double yum!!! When we go to Grass Valley, let”s do this for them, OK? HOLY MOLY! Those look unreal. I can’t wait for you to do this again. I’m putting sausage in mine. 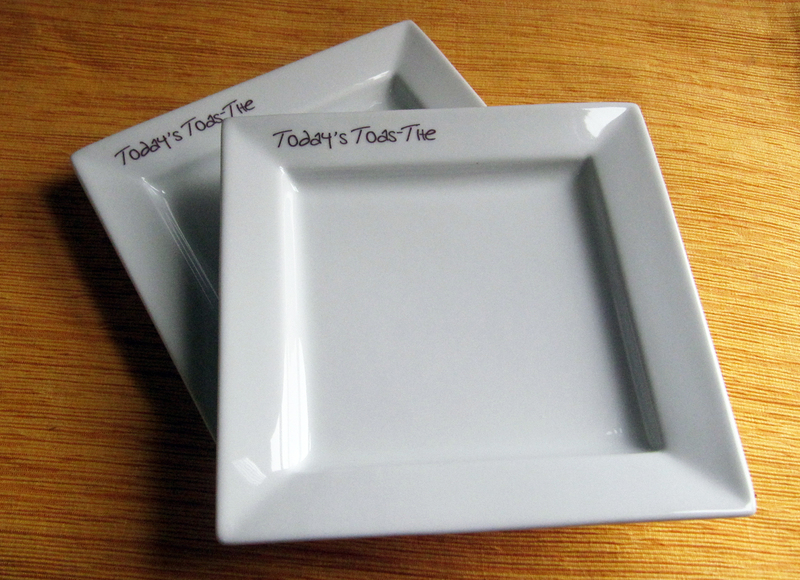 Making these for my parents breakfast in a few days. Thanks for sharing!